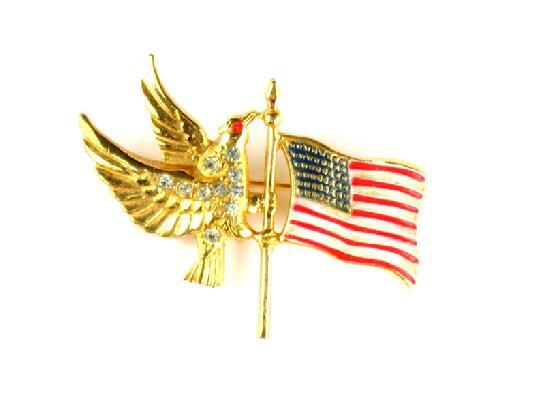 With American Independence Day just around the corner, like every good costume jewelry fanatic, I�m thinking about which jewels to wear on the 4th of July to show my love of country and patriotism. Since I had my patriotic jewels out anyway, this seemed like a good topic for this month�s Jewel Notes. Though I have never collected patriotic jewelry, per se, I did find that I had quite a bit of it on hand. And I was surprised by the variety of pieces and themes that fit into this category of jewelry. My daughter, Jennifer, served in the US Navy for ten years, and I have several pieces of jewelry that I especially treasure because I wore them many times in honor of our Sailor. My favorite is a <?xml:namespace prefix = st1 ns = "urn:schemas-microsoft-com:office:smarttags" />Coro eagle with flag pin. It�s marked �Coro� (the older signature in script) and �STERLING�. The design patent for this pin is #142,201 issued August 14, 1945. I�ve seen other versions of this wonderful piece and it is sometimes marked �Sterling by Coro�; a tiny work of art, measuring only 1 �� x 1�. Note the peaceful eagles below (the three on the right), all facing left and the one with olive branches facing towards them rather than towards the arrows. On the left, we have three wartime eagles, facing right with stretched necks and more aggressive postures. The second and third eagles on the left are World War II era, with the middle one showing a �V� for victory and perched on a �dot-dot-dot-dash� which is Morse code for �V�. Examining an eagle pin for these types of traits can assist in dating the piece. 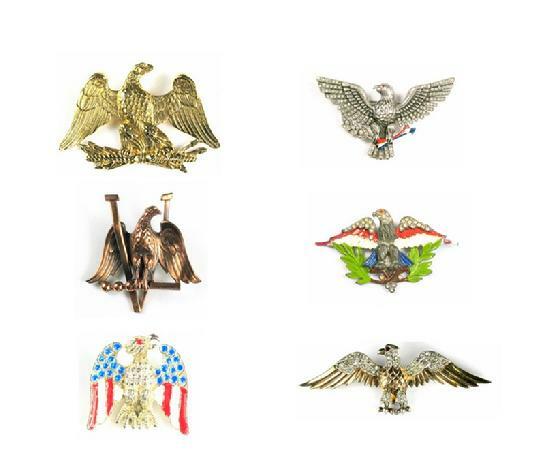 For example, the top left eagle is an Accessocraft pin that was clearly made after World War II (based on its construction and back texture), but is a right-facing-towards-the-arrow wartime one. My guess is that it was made during the Vietnam War. In addition to my <?xml:namespace prefix = st1 ns = "urn:schemas-microsoft-com:office:smarttags" />Coro eagle with flag pin, I have three more patriotic pieces that I wore frequently during my daughter�s service in the Navy. These pins each include an eagle and a service star motif. All are sterling silver, and the top one and the chatelaine were made by Coro. 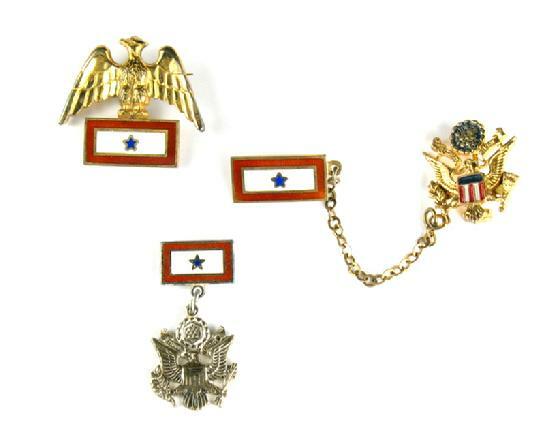 The service star emblem is found on many pieces of patriotic jewelry from the 1940�s and the design is a representation of the service star banners displayed by the families of individuals on active duty military service. The banner was typically placed in a window facing the street. A blue star denotes a living family member, and a gold star represents a deceased one. Sometimes more than one star appears to honor two or more service members from the same family. These banners originated during World War I and were displayed by the original Gold-Star Mothers. During World War II, they were actually the subject of an act of Congress that addressed the display, usage and manufacture of service star banners. So, the banners came first and the jewelry is a representation derived from the banners. What is commonly referred to as �Sweetheart� jewelry frequently uses the service-star-banner motif along with wording such as �Son in Service� added to the piece. 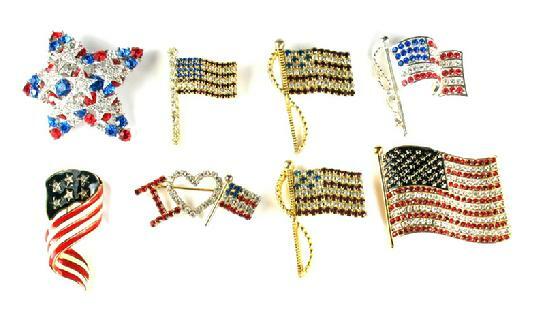 In my stash of patriotic pins, I also have a few �ribbon� pieces. The first of these types of pins were red and were worn in support of people with AIDS. During the First Gulf War in the early 1990�s, the yellow ribbon motif became popular, and yellow-ribbon jewelry was worn to express patriotism. Okay, you�re going to hate me, but I can�t stop thinking of that song that Tony Orlando and Dawn gave new life in the early seventies, �Tie a Yellow Ribbon Round the Ole Oak Tree�. Please don�t call me at midnight when you can�t get that one out of you head! But I digress; back to ribbon jewelry, I wanted to share one given to me by a friend many years ago. 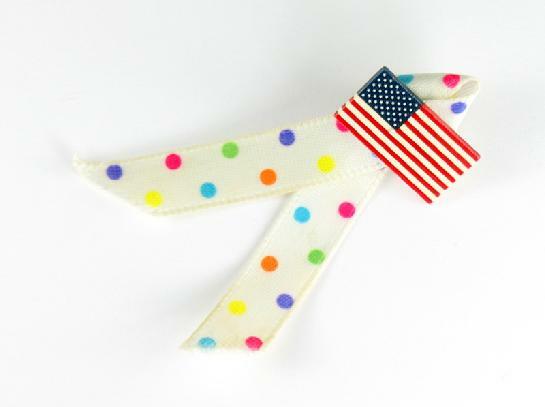 It is my Ribbon Awareness Ribbon with Flag pin! Isn�t it nice to have a friend with a very well-developed sense of humor? 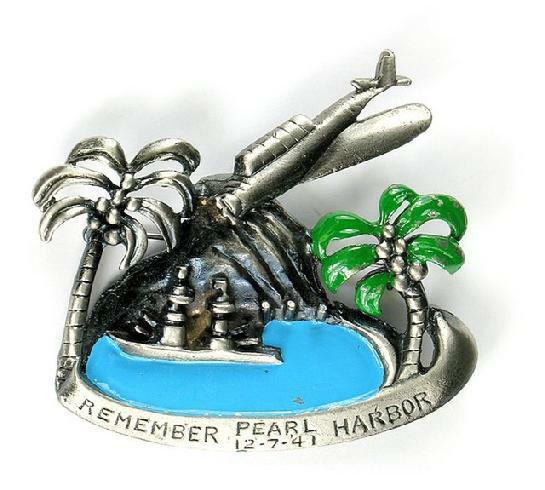 Also among my jewels is another classic patriotic pin designed in 1942 and depicting <?xml:namespace prefix = st1 ns = "urn:schemas-microsoft-com:office:smarttags" />Pearl Harbor. Mine is a much later one, so this design was manufactured for many years. Keep that in mind if you are considering buying one of these pins, as it may be difficult to tell the older and newer versions from just a photograph. I didn�t consider wearing this piece for July 4th, as I like to save it to wear on Pearl Harbor Day. I first met my husband-to-be on December 7, 1980, so Pearl Harbor Day is actually quite a celebration at our house. 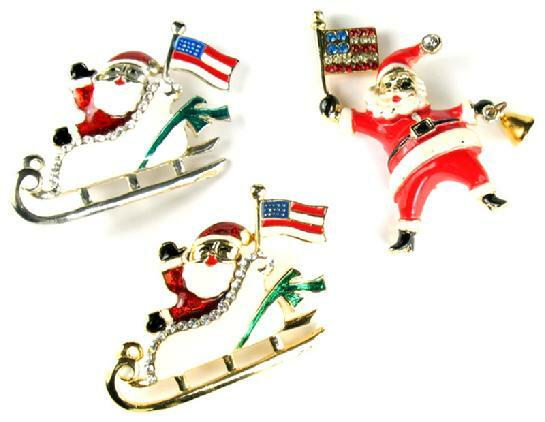 Speaking of December holidays, my Santa-with-a-Flag pins definitely express patriotism, but might be a tad unusual to wear for Independence Day. Back in the box they go for a few more months. Since my husband is in the business of manufacturing flags, I also own a fair number of contemporary flag pins. Of the ones pictured below, only the top right one is marked (Napier). The lower left-hand one was created to be sold at theatrical productions of �Ragtime� in 1998. I don�t know if the pin is making a resurgence now with the revival of the musical. The other six pins are fun, but not particularly noteworthy, though for some reason they do bring to mind the Great Wall. There is some really great patriotic-theme costume jewelry designed by contemporary artists including Wendy Gell and Dorothy Bauer (she did a bib necklace that is to-die-for). Lunch at the Ritz also produces some fabulous designs with this theme. Sadly, none of those pieces reside in my jewelry box. We�ve come full circle now, and I realize that I�m not just writing about some of my patriotic jewelry, but have had much more to say about its personal meaning to me. For many of us, when we open the jewelry box, it�s not just about decorating our bodies for the day, but is just as much about brightening our spirits and celebrating our lives. So what did I decide to wear for my 2010 4th of July celebration? Drum roll please�.red-white-blue Florenza beads! 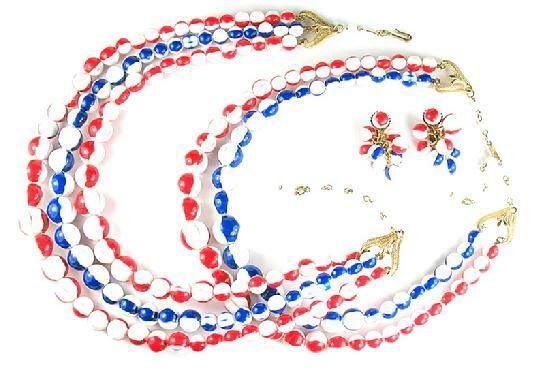 Since I have collected and researched Florenza jewelry for many years, this set is very meaningful to me; I�ve worn it for several patriotic holidays and it holds many happy memories. So get busy ladies and gentlemen: What are you wearing for American Independence Day? And, who knows, perhaps the most interesting answers will come from our JR members from outside the <?xml:namespace prefix = st1 ns = "urn:schemas-microsoft-com:office:smarttags" />US!